Krudtløbsvej is undoubtedly one of Copenhagen’s coolest streets and so few Danes know of its existence. Running side by side the canal opposite the Royal Naval Base, this lavish treasure is home to one of the city’s most respected design showrooms, Design Werck. 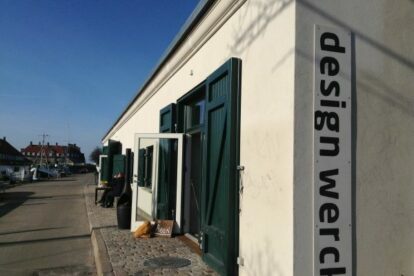 My regular walks in this area would be incomplete without a visit to Design Werck. Copenhagen’s reputation for its furniture and industrial design is indisputable. For two generations Danish design talent has been lavishing an adoring global audience with intelligent, playful and sensuous objects that have become an integral part of Denmark’s and especially, Copenhagen’s international brand. Your average Nordic consumer is well versed in Danish design providing a healthy market for furniture and lifestyle stores in the Danish capital. Every hood in Copenhagen appears to have its own particular design store preferably in a unique location, such as Normann Copenhagen flourishing in an old cinema in Østerbro or DANSK: Made For Rooms in Vesterbro’s rejuvenated red-light area. Housed in a former naval building facing the docks once home to the Danish Royal Navy, Design Werck has found the perfect setting for showcasing its brand and products. Not content with over 30 design brands on show, Design Werck collaborates with Vin Werck hosting a wine bar in this spacious showroom taking the retail experience to new levels. Copenhagen’s design community and its enlightened consumer have one more reason to be happy with themselves. Offline Copenhagen tips? Get our iPhone / Android app!